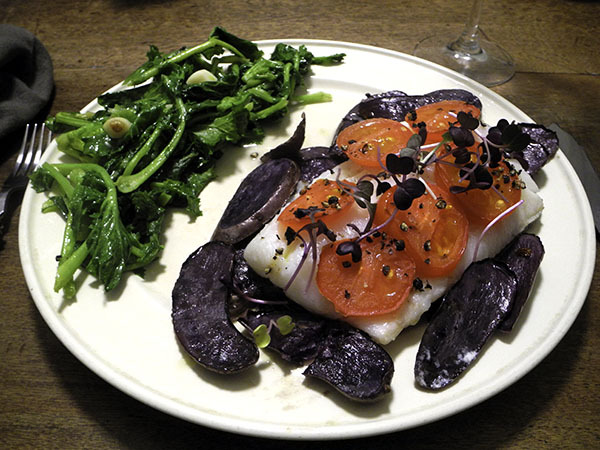 The aura of New England cod. 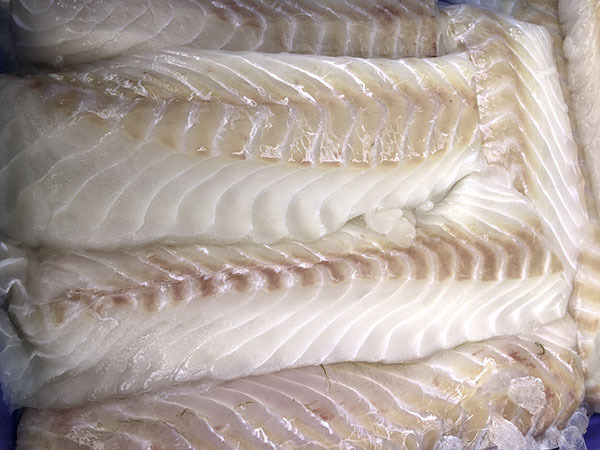 I think I’ve understood its emanation since at least the time I was cramming for a family trip to New England in the early 50’s, so when Glen Bickleman told me that the bucket of cod fillets he was displaying in his fish stall, caught out of eastern Long Island ports, were “whale cod”, my imagination went a little wild. I had thoughts of New England fishermen conjuring some heroic finned giant, a legend with which I was not familiar (since the mid-80’s, when I moved to New York from Rhode Island, I’ve thought of eastern Long Island as very much a part of the culture of New England). Checking out the name on line once I was back home, I was only slightly disappointed to learn that it referred to a real phenomenon: “Old timers talk of the mythic “whale cod,” huge fish, as long as a man is tall, that [returned] every Thanksgiving for fishermen to load into trailer trucks bound for Fulton Fish Market in New York.”, reads one reference to the phrase. More evidence of the scale of the giant real cod can be found in the entry on Wikipedia for the sculpture that hangs inside the House of Represen­ta­tives chamber of Boston’s State House‍: “The Sacred Cod is a four-foot eleven-inch carved-wood effigy of an Atlantic codfish, ‘painted to the life’…’ (it’s significance is analogous to that of the wool sack in the House of Lords). Glen may have been exaggerating a little yesterday, but we should remember that fishermen used to be shorter. 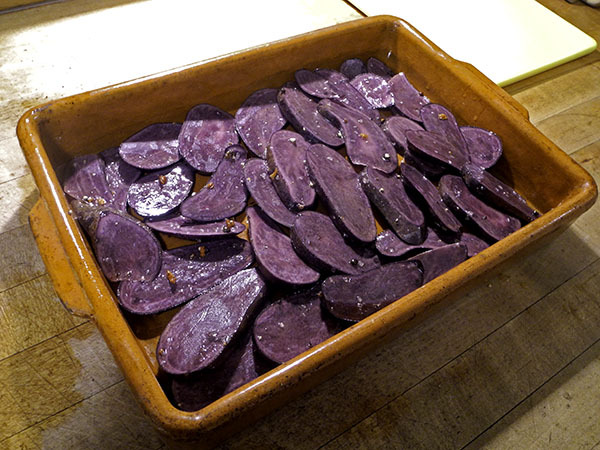 The dinner itself began with some unusual potatoes. They weren’t chosen for their color, but for the fact they were the only ones I had that were of both a suitable size and number. 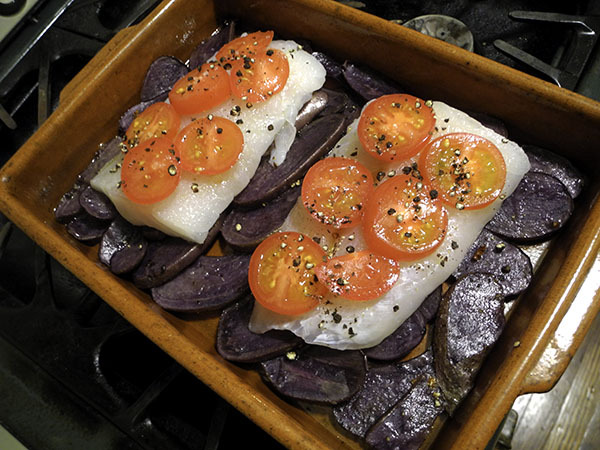 The potatoes were cooked first, but not quite all of the way; the cod fillet, divided into 2 sections, and the sliced tomatoes were then placed on top and the pan returned to the oven. 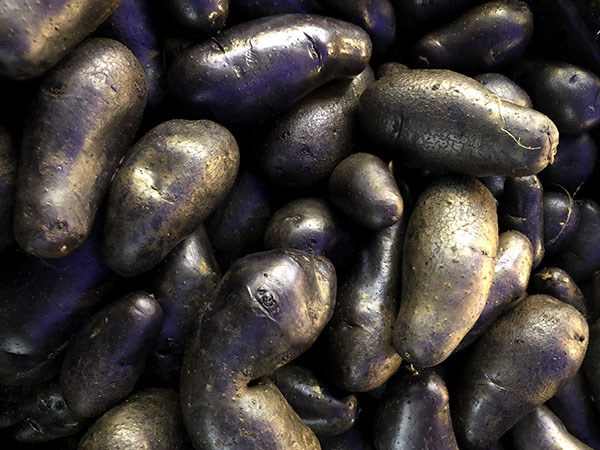 These potatoes are pretty spectacular. 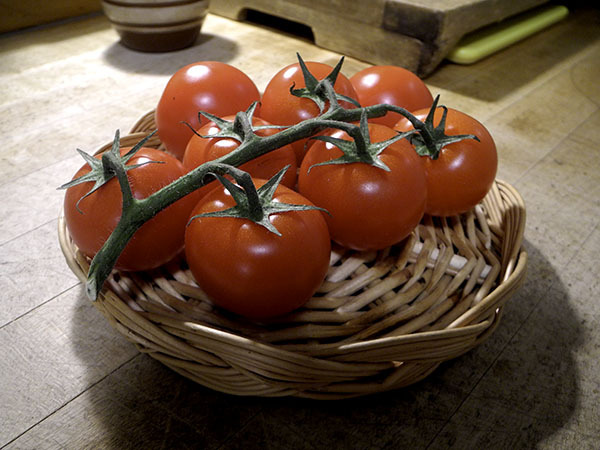 Over the years these almost-local Maine tomatoes have become an occasional kitchen mainstay [sorry about that one] for me through the relative dessert of New York winters. I’ve learned, again, over many years, just how incredibly diverse even some of the vegetables with which we’d grown up assuming they had almost no variety can be. 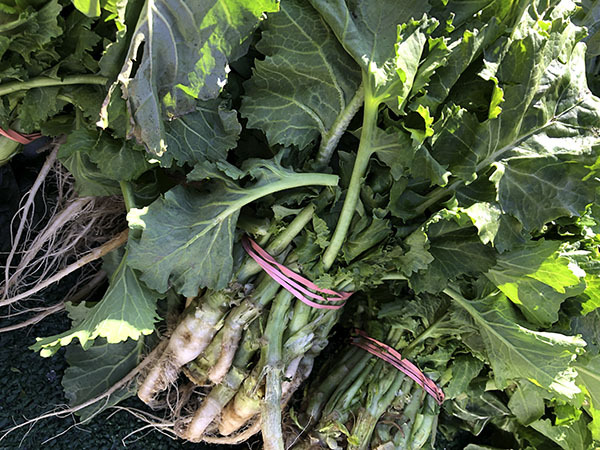 Although I certainly didn’t grow up with it in mid-century Detroit, I’m very fond of broccoli rabe, and I know that it comes in many forms, like so many other edible plants local farmers are bringing to markets these days.